Village of Woodstock, P.O. Box 488, Woodstock, VT 05091; phone: 802-457-3456. Photo: General Lyman Mower House, ca. 1823, #16 The Green, Woodstock Village, VT. Photographed by user:Jerrye and Roy Klotz, MD, 2005, (own work) [cc-by-3.0 (creativecommons.org/licenses/by/3.0)], via Wikimedia Commons, accessed April, 2016. The basic form of the Village of Woodstock has not been significantly altered since the early 1800's. Today, abundant greenspace, a variety of historically significant architecture, and adequate municipal facilities create an exceptional environment overall. The Village has a distinct pattern and quality of settlement which has emerged over time. Its form has been influenced by cultural and social attitudes, as well as natural formations and processes. At one time the hillsides surrounding the Village were predominantly open fields. As farming receded from prominence however, a thick vegetative canopy of second growth trees came into existence. Today, woodlands in association with smaller acreage open fields, vernal pools and fens provide habitat for a variety of wildlife species. The Village structure represents a development strategy which emerged during an important period in American history. Buildings of historical, architectural and cultural merit date from the late 18th and early 19th centuries. 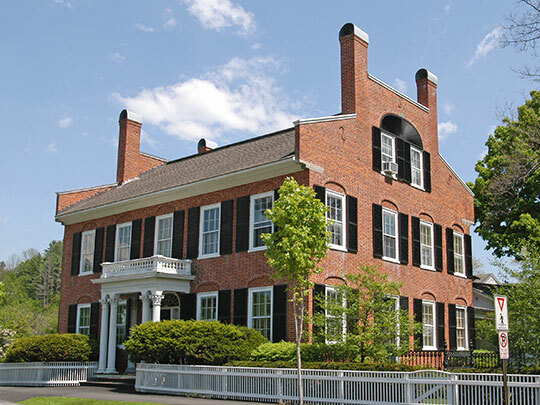 A diversity of traditional architectural styles are represented: post-Colonial, early Federal, and Greek Revival. These are complemented by some Georgian, Gothic Revival, Second Empire, and even Romanesque and Queen Anne Revival buildings.